I don't make muffins very often these days, since it's just the two of us most of the time. (You can indeed have too many low-fat muffins, by the way!) But we had a visitor for a few days and one of my granddaughters came over as well one day, so muffins seemed appropriate. Below are the recipes for the two muffin recipes I made during the last few days. Muffins are pretty easy to veganize, and to make lower in fat. I like muffins that are moist, not crumbly and dry, too, and it's not difficult to achieve that. My muffin batters are a little bit runnier than you might be used to (like my cake batters), but that seems to be a plus. My standard procedure is to use pastry flour (usually a whole wheat type) instead of all-purpose flour because it contains less gluten. If you are using plenty of fat, the flour's not a problem, because the fat coats the gluten in the flour and makes it tender. However, if you use less fat, you want to use a flour that is lower in gluten content, such as pastry or cake flour. This is made from a soft wheat, whereas bread flour is made from hard wheat, and all-purpose is in between. I generally substitute smooth unsweetened applesauce for up to 3/4 of the fat called for. I freeze canned or homemade applesauce for baking in ice cube trays and pop the cubes into zipper-lock bags. Each one equals 2 tablespoons, making it easy to measure it out and eliminating waste. I use 1/4 cup nondairy milk (I generally use soy, which contains some lecethin, as egg yolks do) in place of each egg-- sometimes I add flax, sometimes I use a little egg replacer, but I usually keep it simple in muffin recipes. I made the following muffins as a breakfast muffin. They are not super-sweet, which I prefer. These muffins are super easy and quick to make, but nice enough for afternoon tea or coffee. Heat oven to 400ºF. Grease 12 muffin cups, or use paper cupcake liners or parchment muffin cup liners (how to make your own), I don’t like to use silicone liners with muffins because I like a bit more f a crust on muffins, as opposed to cupcakes, which need to be softer. In a small bowl, mix together the Topping ingredients with your fingers and set aside. Whisk together the Dry Mix ingredients in a medium mixing bowl. Whisk together the Wet Mix Ingredients in a medium bowl or measuring pitcher until smooth. Add the Wet Mix to the Dry Mix and mix briefly. Spoon evenly into muffin cups. Sprinkle the tops of the muffins evenly with the Topping. Bake for about 22 minutes. Place pan on a baking rack to cool for at least 5 minutes before serving. The muffins can be eaten hot or at room temperature. Cool leftovers thoroughly before storing in a plastic bag or rigid plastic container. These freeze well. 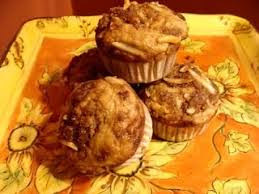 Nutrition (per muffin): Nutrition (per serving): 214.4 calories; 25% calories from fat; 6.3g total fat; 0.0mg cholesterol; 172.2mg sodium; 170.2mg potassium; 36.0g carbohydrates; 3.0g fiber; 13.9g sugar; 33.1g net carbs; 5.1g protein; 4.2 points. 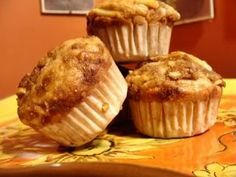 These next muffins are a favorite of mine, because I love anything corny, and these are double-corny! The stoneground cornmeal contains more fiber than the ordinary refined type. The creamed corn (which actually contains no cream) adds more fiber, and makes the muffins moist and sweet without added sugar and with very little oil. 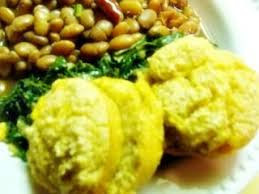 A perfect go-with with our Border Beans and braised greens for dinner last night. This recipe is from my book, "The Fiber for Life Cookbook". Preheat the oven to 375 degrees F. Grease 12 muffin cups, or use paper cupcake liners or parchment muffin cup liners (how to make your own), I don’t like to use silicone liners with muffins because I like a bit more f a crust on muffins, as opposed to cupcakes, which need to be softer. Mix the Dry Mix ingredients together well in a medium bowl. Blend the Wet Mix ingredients together well in a deep bowl or medium measuring pitcher, using a hand/immersion blender or whisk. Pour the contents of the can of creamed corn into the blended Wet Mix and stir gently but thoroughly. Pour this mixture into the Dry Mix and mix briefly. Spoon the batter evenly into the muffin tin. Bake 20 minutes. Place the muffin tin on a rack, cover the muffins with a clean tea towel and cool for a few minutes before serving hot. Cool leftovers thoroughly before storing in a plastic bag or rigid plastic container. These freeze well. Nutrition (per muffin): 110.8 calories; 14% calories from fat; 1.8g total fat; 0.0mg cholesterol; 227.8mg sodium; 121.0mg potassium; 22.3g carbohydrates; 2.4g fiber; 1.5g sugar; 19.9g net carbs; 3.2g protein; 1.9 points. NUTTY AND/OR FRUITY CREAMY CORN MUFFINS: Add 2/3 c. chopped toasted walnuts or pecans; and/or 1 c. fresh cranberries or blueberries, or 1/2 c. dried cranberries or blueberries, or 3/4 c. chopped pitted prunes. Bake the batter in 12 greased muffin cups for about 25 minutes at 400 degrees F.
HOT CHILE SURPRISE CREAMY CORN MUFFINS: Make muffins as directed above, but spoon only half the batter into 12 muffin cups. Spoon about 2 tsp. of hot red pepper or jalapeño jelly into the center of each portion. Top with the remaining batter and bake as usual. GREEN CHILE CREAMY CORN MUFFINS: To the batter, add 1 (4 oz.) can , drained well, of chopped green California chiles. Sprinkle the top of each unbaked muffin about 1/2-1 T. vegan parmesan or other vegan cheese. BASIL PARMESAN CREAMY CORN MUFFINS: To the batter, add 1/4 c. chopped fresh basil and 2 T. vegan parmesan. Sprinkle the top of each unbaked muffin about more vegan parmesan. These muffins look delicious. I think I'll try to bake the Almond Crumb Muffins. I don't really like corn muffins at all. Thanks for providing a great a vegan recipe, and for your baking tips. I didn't know about gluten in the flour before, and what it had to do with fat. Enjoy your evening!